I was so thrilled when I heard that Jared Flood was going to be teaching classs at Nine Rubies in San Mateo! I really wanted to take all of the classes he offers because he is not only one of my favorite designers, but also an immaculate knitter. I settled on the Seemless Sweater Class. He hit the ground running with information. It was litterally three hours of intense instruction and note takeing, while trying to swatch a piece of fabric that had 4 different options for raglan decreases. Not to mention I was a little late because I took Hwy 92 in the opposite direction and went all the way over the bridge and back! Good thing I left 20 minutes early and the parking gods smiled on me because there was a spot right in front of the shop. And thank goodness that Sue saved me a spot – thanks Sue!! Jared designed a few patterns that I have already done (see the hemlock and turn a square hat). And a few projects that I want to do like the Koolhas hat, a baby blanket, and the adult tomten jacket. 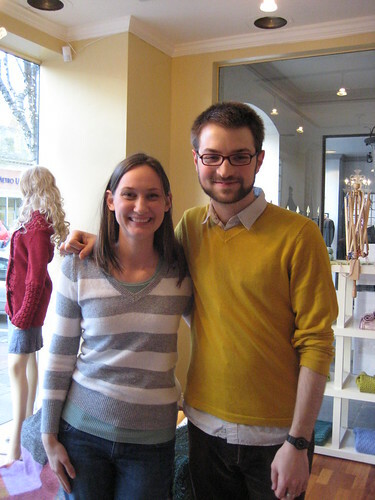 Aren’t his knits and designs gorgeous?? It was money well spent. I feel like I could go off and make a sweater based on a swatch that I like… now I better go do that quick before all the great instruction disappears from my head!